The Parish Council meets on the third Tuesday of the month (except August and December) at 7pm in the Village Hall. The meeting is open to the public who are welcome to attend meetings of the Parish Council and its committees. A short period is set aside at the beginning of each meeting to enable members of the public to make presentments. The Annual Parish Meeting is always held on the fourth Tuesday of April. The schedule of all Parish Council and Committee meetings for the year is publicised in advance on the Parish Council notice board in Brookley Road and on the Council's website; details are also available from the Parish Clerk. Minutes of Parish Council meetings and other papers are available by clicking here or from the Parish Clerk. The Parish Council Planning Committee, as a Statutory Consultee, comments on local planning applications and forwards its views to the New Forest National Park Authority (NFNPA) for consideration in its role as the planning authority. The meeting is open to the public and comments and concerns relating to planning applications can be addressed to Councillors. The meeting usually takes place on the fourth Tuesday of the month but this is subject to change so please contact the Parish Clerk to check the date of the meeting and/or when a particular application is being discussed. If you are forwarding written comments to the NFNPA it is helpful to send them to the Parish Council as well, preferably by email. Minutes of Planning Committee meetings and other papers are available by clicking here or from the Parish Clerk. Planning applications are available to view at Lymington Town Hall during public opening hours or via the Planning section of the NFNPA website. The Amenities & Infrastructure Committee meets three times per year but any items of concern can be reported to the Parish Clerk in the interim. Minutes of Amenities & Infrastructure Committee meetings and other papers are available by clicking here or from the Parish Clerk. The Personnel & Resources Committee meets at least three times per year and deals with all financial and staffing issues, including setting the precept each year. Minutes of Personnel & Resources Committee meetings and other papers are available by clicking here or from the Parish Clerk. 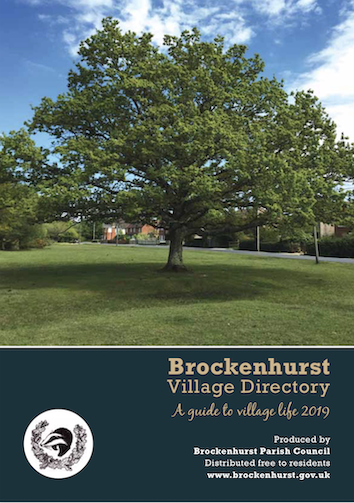 Please note that inclusion is at the discretion of the Parish Council and generally restricted to organisations which operate out of the Parish and/or those of which a substantial proportion of their operations relates to serving Brockenhurst and the surrounding areas. Inclusion of an organisation's details does not constitute endorsement or support by the Council. The Parish Council endeavours to consult with residents to guide its own work and priorities but also provides input to external consultations being carried out by external bodies (such as New Forest District Council or the New Forest National Park Authority) which may impact on our Parish. These consultations are considered by Parish Council Committees as appropriate whose meetings members of the public are welcome to attend. Residents will be alerted to these discussions via the Agendas and Minutes of the respective Committees, but comments will also be invited via our website and Newsletter. Any comments relating to consultations should be addressed to the Parish Clerk, ideally by email. Please contact the Parish Clerk for details of current consultations. A report on the findings of the "Serving Hampshire" public consultation was considered by Hampshire County Council Cabinet on 14 November 2016 which included headline messages from a series of separate workshops run in different parts of the County in September 2016 specifically for parish and town councils. The report can be viewed here. Over 130 local councils, including Brockenhurst Parish Council, participated in these workshops which were chaired by Cabinet Members and involved presentations from the Chief Executive of the Hampshire Association of Local Councils and senior HCC officers. The purpose of the workshops was to explore how the County Council and town and parish councils can best work together in future through enhanced 'locality working' and exploring potential opportunities for 'deeper devolution'. Commenting following the November 2016 Cabinet meeting, the County Council's Leader, Councillor Roy Perry said: "We have weighed up some important matters around the issue of devolution and local government reorganisation. In particular, serious consideration was given to the feedback we received from the 5,000 plus residents, businesses and key stakeholders who responded to our Serving Hampshire consultation held earlier this year. Essentially, the main messages were that there was very little support for breaking up Hampshire by creating additional tiers of government. Instead, people care more about the services they receive; easier access to all Council services; and more value for money. I am pleased to say these views endorse the position that any deal should achieve best outcomes for the whole Hampshire area - which we believe can only be achieved by keeping Hampshire together. Remaining as one whole County protects the quality of vital County-wide services, such as highways and health and social care, and delivers value for money for the taxpayer. Splitting organisations inevitably adds costs as it takes away efficiencies and economies of scale". This consultation is now closed. 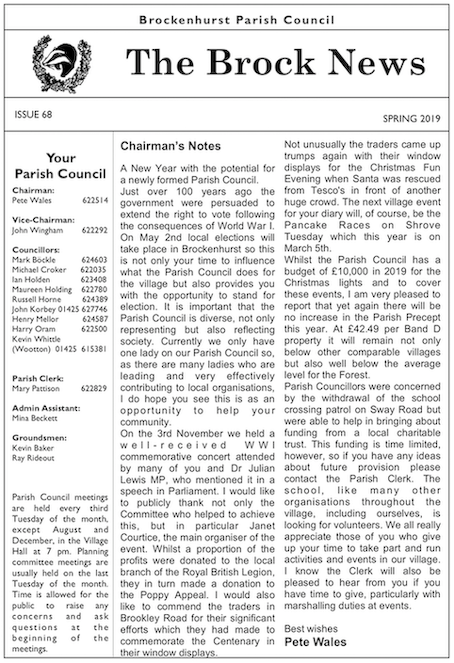 Brockenhurst Parish Council's response can be viewed here. This consultation closed on 26 August 2016. Further information is available here. This consultation is now closed. The Parish Council's response can be viewed here.